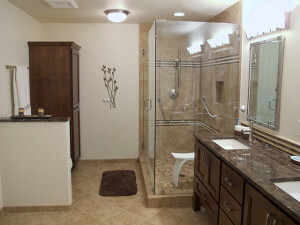 Upgrading and updating a bathroom is a great interior remodeling project that will add value to a home. It used to be a common belief that a home without a bathtub detracts from its value. With more people choosing to stay in their homes longer or open their homes to the care of elderly parents, more people are choosing shower-only bathroom remodeling plans, with no-threshold “curb-less” showers that have flip-up seats and grab bars. With grab bars in the shower and around the toilet as such a common home safety necessity now, they don’t need to look institutional. There are options available in warmer styles for a more contemporary blend with your bathroom décor. No-threshold curb-less showers with flip-up seats and grab bars are becoming common place. Even if you don’t intend to install grab bars just yet, it’s a good idea to plan for the future by incorporating the installation of blocking in the walls behind the tile during your bathroom remodeling project. Motion-sensor technology is nearly standard in modern public restrooms and makes just as much sense to include in your home bathroom remodeling project. Automatic faucets and motion-sensor lights can reduce energy use as well as germs on surfaces. For some residents or visitors in the home, touchless fixtures are also a safety measure to avoid frustration or accidents while reaching for faucets and switches. Other accommodations to consider would be lever handles instead of knobs and push open/soft close mechanisms for drawers and cabinets. Hands-free technology should also be included in your kitchen remodeling plans, since this is another area where faucets and fixtures are in heavy use. Along with motion-sensor fixtures, another way to lower your utility bills is with new energy efficient toilets and shower heads that can significantly cut your water use. Low flow toilets use about 50% less water and shower heads with aerators have more power than the standard but use half as much water. All this is great for the environment and great for your wallet too. The money you save reducing water and energy use in your bathroom could go toward replacing old surfaces that need updating. If a new tile surface is part of your bathroom remodeling project, consider using renewable or recycled content materials.